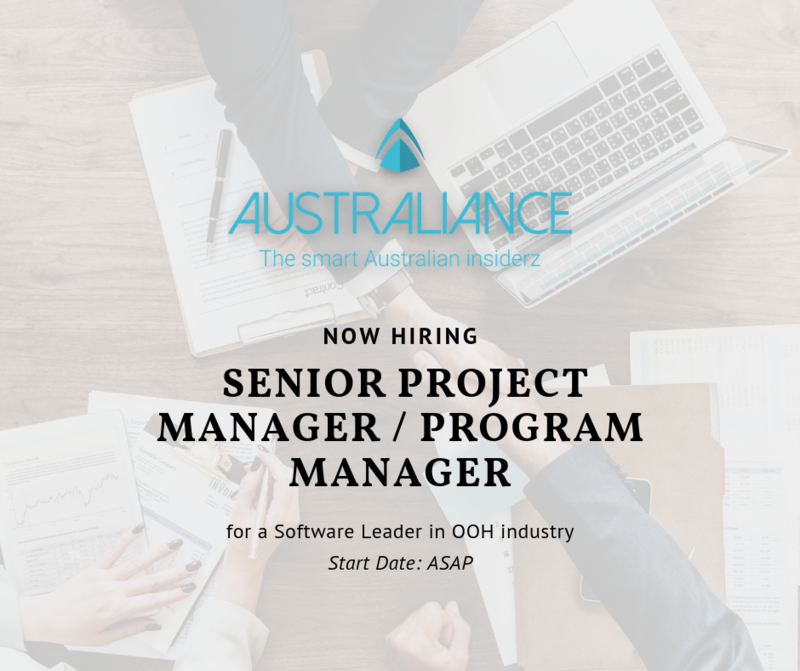 Australiance is looking for Senior Project Manager / Program Manager – based in Sydney – for an international company proposing the best software solution for the largest Out-of-Home advertising media companies in the world to cope with their rapid expansion in the region. Reporting to the Managing Director APAC, you will be responsible for implementing enterprise-wide software solutions for Out-Of-Home Media clients in the Asia Pacific region (primarily Australia & New Zealand), working closely with internal product managers, key stakeholders, and customer project teams to ensure the successful and timely delivery of the Platform. Maintain an up-to-date project plan that provides near real-time details of the project’s status by analyzing and documenting all existing information on project objectives, deliverables, schedules, project profitability, financial opportunities, assumptions, constraints and dependencies, etc. Assist the management in the monthly client invoicing process. You are customer centric, passionate, extremely organized and autonomous; you are able to multi task and prioritize while working under pressure in fast changing environment. You have excellent communication, presentation, negotiation and interpersonal skills combined with a real business acumen and natural leadership. You are willing to travel throughout APAC region on regular basis. You have a solid expertise in the areas of software development, user experience design, and agile software methodologies. You have a Bachelor’s degree in Computer Science or similar. You are proficient in MS Word, Excel & Project. Experience in SQL and active PMP certification, Prince 2, Scrum Master or similar a strong plus. If you are shortlisted, we will contact you to discuss your experience, motivation and expectations to ensure your profile is aligned with our client’s expectations. Eventually we will conduct a face-to-face (or Skype) interview to review your profile in-depth and provide you with more details about the role and the team. If matching the role and our client’s expectations, you will then be interviewed directly by the client.